These directions apply to Brother Machines; designs could be used as they are and programmed into Passaps, other brands would require some adjustments. In these samples the holes resulting from holding for 2 row sequences are considered part of the design. Vertical strips in different colors could be knit and later joined. The final result is a “zig zag” pattern. Written directions may read: to begin, cast on and knit 2 rows. **COR: set machine for holding. Place in hold all except the first 2 needles on the right (carriage side). Knit 2 rows. Return to work the next group of 2 needles on the left to work, knit 2 rows. 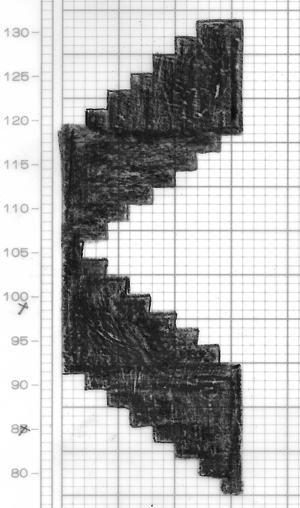 Repeat until only 2 needles on the far left are in hold, return them to work, knit one row (color 1 in chart below). COL: pull first 2 needles at far right to hold, knit 2 rows, repeat until last 2 are left in hold, knit 2 rows (color 2). COL: bring next 2 needles into work, knit 2 rows, continue until the last 2 stitches are returned to work on the right, knit one row (color 3). COR: pull first 2 needles on left into hold, knit 2 rows; repeat until last 4 stitches at right are put back into work, knit 2 rows**, and repeat from **. Knit 2 rows at end of desired number of repeats, bind off. When producing my charts for using slip stitch to automate holding I like to draw what I would actually be knitting for each row, each stitch and row being a filled square, so the colored areas below represent knit stitches/rows on each row, the blank squares the stitches in holding. I test the repeat as a hand technique first, before in my case marking the mylar, then essentially fill in the knit stitches with color, keeping in mind the location of the knit carriage and the direction of the knitting. The colored squares are then programmed as punched holes, black squares or pixels, and the pattern may be knit using slip stitch <—>. Needle selection needs to be cancelled, otherwise the yarn will be knit on the side of non selected needles on that last stitch, creating a long float. The selection row needs to be toward the first 2 knit rows sequence. Here they are knit beginning on the right for 2 rows, so selection row is made from left to right. Odd rows move, knitting, from right to left, even rows from left to right. At this point I prefer mac numbers for charting. Next Next post: “wisteria” cousin2 aka “fern leaf”, hand tech.